Aging drinking water mains are facing an increasing number of failures leading to service interruptions, higher operating costs and non-revenue water loss. Some failures cause bigger ﬁnancial or socioeconomic impacts than others. With ﬁscally tight budgets, water utilities face an uphill battle discerning which pipes in their system need to be replaced and when. Deteriorating water mains threaten a water utility’s ability to deliver safe and secure drinking water to its customers. Part of providing safe and secure drinking water is taking care of a system’s facilities and equipment and planning for any needed rehabilitations and replacements. Asset management plans help utilities meet these goals in an efficient and cost-effective manner. Asset management is a planning process that ensures a utility gets the most value from its assets and has the financial resources to rehabilitate and replace them when necessary. Asset management also includes developing a plan to reduce costs while increasing the efficiency and the reliability of assets. Successful asset management depends on knowing about a system’s assets and regularly communicating with management and customers about a system’s future needs. One element of an asset management plan is the condition assessment. A condition assessment measures the collective condition of assets within the water distribution system. An assessment of individual assets is not necessary, but may be performed using statistical or other sampling methods. Trained individuals using prescribed forms or analytical techniques should undertake condition assessments. Financial reporting standards (e.g., GASB 34) do not specify attributes of infrastructure assets that should be measured when performing assessments. Consequently, utilities may use an attribute or any combination of attributes they consider appropriate. 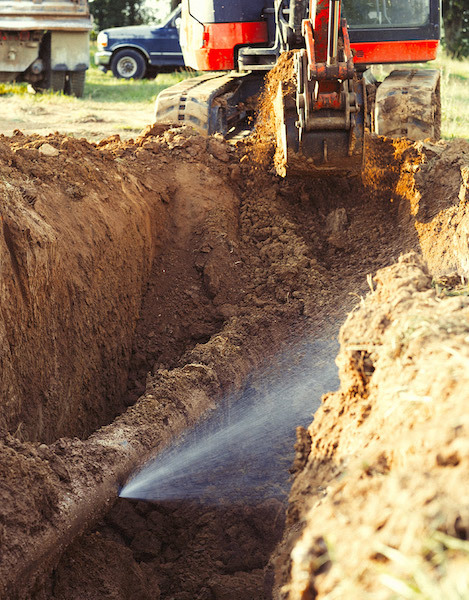 Traditionally, condition assessments of buried water mains typically fall into two categories: indirect and direct. An indirect desktop study method should always occur first. A direct or physical inspection and condition assessment is accurate for the pipe tested but it tends to be slow, expensive and labor intensive. Multiple physical measurements are required for correlation and confirmation. The results are difficult to extrapolate to system-wide recommendations, which could be based on arbitrary assumptions and weights. performance-based management of these buried assets historically has not been performed in the water industry. A more robust approach would be a large-scale comparison of various factors to generate a refined and accurate prediction-based assessment on the disparate interactions between component variables. Machine learning has emerged as a technology to make a significant impact in buried water infrastructure asset management. Machine learning consumes large, complex data sets containing more variables than what humans can process with current tools. This objective, data-driven method overcomes human limitations with their inherent subjectivity and biases and provides more accurate results that help utilities make better replacement decisions. Machine learning tools can be used to assess pipe throughout an entire network. Asset management practices combined with the latest condition assessment tools using artificial intelligence, specifically machine learning, to assess the condition of water buried water mains provides a new method for aligning maintenance, repair and replacement strategies to better allocate limited resources. A machine learning-based condition assessment tool can make a signiﬁcant impact in buried water infrastructure asset management. Underground pipe performance evaluations can be established with an objective, data-driven approach like machine learning and can be used to meet financial reporting requirements of a system-wide condition assessment every three years. This reduces the time required by accounting to report on buried infrastructure systems while increasing the accuracy and value of the financial statements. Fracta has commercialized a machine-learning-based condition assessment software solution. The cloud-based software solution uses machine learning to assess the condition of drinking water distribution mains. The platform is integrated with Esri ArcGIS software to allow mapping and geographical visualization of the water mains, and can be connected to other utility software applications, such as enterprise asset management, computerized maintenance management systems, and hydraulic modeling. In a Circle of Blue article, it was reported that East Bay Municipal Utility District (EBMUD) and San Francisco Public Utilities Commission (PUC) are working with Fracta to help guide their pipe replacement decisions. Brett Walton, the article’s author, said that both utilities are in the early stages of increasing annual water main replacement. EBMUD replaced 15 miles of water mains last year, and plans to replace 20 miles a year by 2020. The long-term target is 40 miles per year. “Our breaks are all happening in high-risk-of-failure pipes,” said Katie Miller, manager of the water distribution division at San Francisco PUC, in the same article. Miller went on to say her team, which started working with Fracta in 2016, is now using the risk scores to deploy acoustic sensors that listen for leaks in the pipes most likely to fail. The solution is comprised of three core functional capabilities. First, Likelihood of Failure (LOF) determines the statistical probability that a water main will fail, leveraging existing data with hundreds of variables. Second is Consequence of Failure (COF), which determines the consequences or severity of the failure and quantiﬁes the direct and indirect costs of those water main failures. LOF and COF are then used to calculate the Business Risk Exposure (BRE). BRE is the third core capability. BRE is calculated in terms of direct and indirect costs using the formula: LOF (%) x COF ($) = BRE ($). This approach provides an objective risk assessment for the entire water distribution system and translates the results into ﬁnancial terms water engineers, planners and ﬁnance professionals can use to make fast, accurate and capital-efﬁcient risk mitigation decisions about buried water main infrastructure. Machine learning helps utilities move from reactive to preventative and predictive water asset management. It is helping utilities make fast, accurate and cost-efﬁcient decisions associated with water main repair, rehabilitation and replacement. Additionally, utilities are using results to more effectively target their investments on costly leak detection and invasive physical pipe assessments. Incorporating a machine learning condition assessment tool into a proper infrastructure and asset management program will contribute to the reduction of the economic impacts incurred from water main breaks, and more efficient allocation of capital by water utilities. Use of best practices and a more accurate, objective tool will align maintenance and capital repair and replacement strategies to more efficiently leverage scarce financial and human resources. They also inject financial integrity to the planning process and refine the investment strategy so a utility will be in a better position to defend planning efforts and fund needed capital pipe replacement projects.